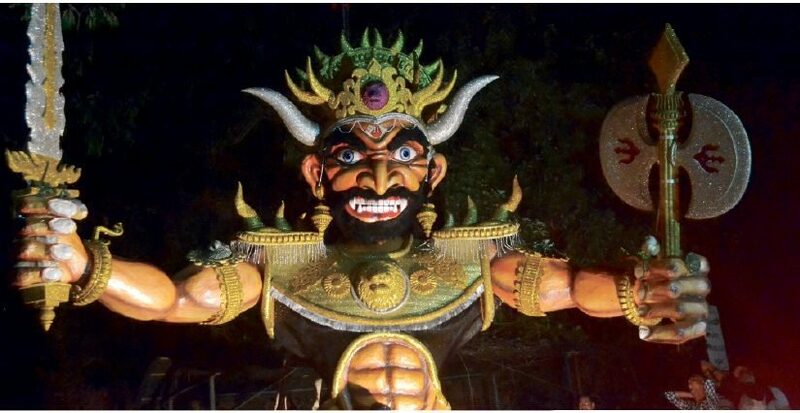 IN Goa it is the mythological legend of Narkasur which appeals more than that of King Ram returning victoriously to Ayodhya after slaying demon king Ravan of Lanka! 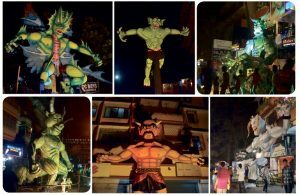 Come the second day of the five day festival of Deepavali and it is effigies of Narkasur which hold sway on almost every street corner in Panjim and around Goa – wherever folk remember the story of Narkasur. It’s a story worth recounting. Who was Narkasur? The Puranas recount that the asura (demon) king Narkasur who was the son of Bhudevi, had won a few boons from Lord Brahma after performing penance. Unfortunately, he was a bad king and didn’t use his boons and blessings for the good of his people. Instead he made their lives miserable, kidnapped women and imprisoned them in his palace for abuse. In short, his reign was one of wreaking havoc and bullying, for power had gone to his head. Narkasur was such a tyrant that in the end the people could no longer take it and they complained along with celestial beings to Lord Krishna. Save them from the tyranny of Narkasur! Now Lord Krishna knew about Narkasur’s invincibility and a boon he had won that only his mother Bhudevi could kill him (presumably under the assumption that no mother would ever kill her child). So Lord Krishna asked his own wife Satyabama to reincarnate herself into Bhudevi’s image and be his charioteer in the battle to kill Narkasur. As the legend goes, one of Narkasur’s arrows hit Krishna and he fell unconscious. And an incensed Satyabama picked up her own bow and arrow and aimed to kill Narkasur. Krishna, of course, recovered and reminded Satyabama of the boon she had taken from him, that parents should take action against their own children if they go wrong. In this case Narkasur’s mother Bhudevi too agreed that the larger good of society comes before love for even one’s own children. And so we celebrate Narak Chaturdashi every Deepavali festival and burn effigies of Narkasur. In Goa people go for a late night walk on the eve of Narak Chaturdashi (14th day of the dark half of Krishna paksh in the month of Kartik) to look at the Narkasur effigies created by various local groups and this year in Panjim one must congratulate them. After the early morning burning of the Narkasur effigies, the groups also cleaned up thoroughly – so that by 9am when folk stepped out on the streets, they were clean. Only the air was filled with the faint remnants of Narkasurs being burnt! Previous post: A QUESTION OF MANNERS!